These Snickers cookies sandwiched together with peanut buttercream and caramel sauce are the ultimate indulgence- you must try them! Preheat the oven to 180c and line 2 large baking trays with greaseproof paper. Cream together the butter, brown sugar and caster sugar with an electric whisk or stand mixer until light and fluffy. Add the eggs and some of the flour then whisk again to incorporate them into the mix. Add the remaining flour and bicarbonate of soda. Mix again. Add the chopped snickers bars and chocolate chips then fold in with a wooden spoon. Roll the cookie dough into small even balls (slightly smaller than a ping pong ball) and line onto the baking trays (allowing space for spreading). Bake for 10-12 minutes. Once cooked allow to cool on the trays while you make the fillings. For the caramel, melt together the butter, sugar and syrup. Once melted, bring to the boil then add the cream off the heat. Stir and allow to cool and thicken. To make the peanut butter buttercream, whisk the butter until light and fluffy. Add the peanut butter and briefly whisk together, then add the icing sugar gradually, whisking constantly until you have a light buttercream. Add some milk if the frosting is too stiff to achieve the desired pipe-able consistency. 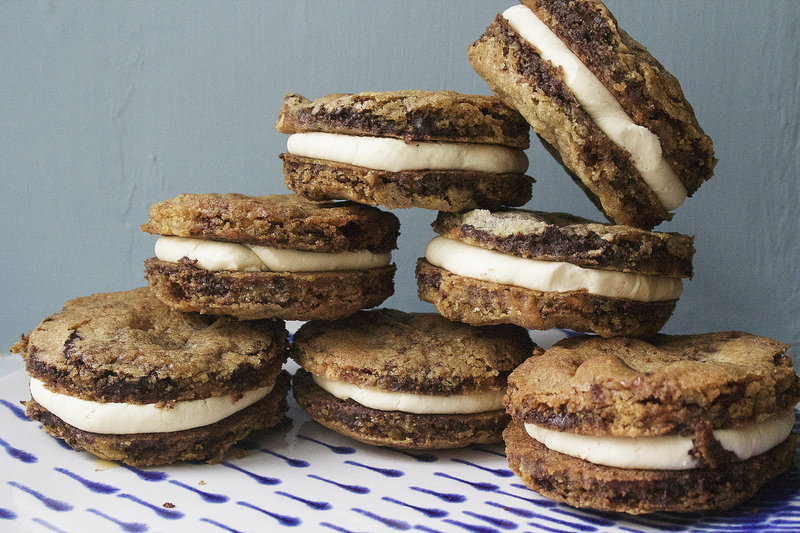 Now it’s time to assemble your cookie sandwiches! Just take a cookie, pipe a ring of peanut buttercream around the edge, fill it with caramel and pair up with another cookie to form a sandwich. I promised more chocolate, so here is the recipe for my second ‘single estate’ experiment, made using a Willie’s Cacao 100% Venezuelan black chocolate block. As the name suggests, this is seriously intense stuff which carries some deep nutty flavours, so I have paired it with macadamia nuts and created a no-bake cheesecake with a smooth and silky texture; this is rich, decadent and best enjoyed with a coffee at the end of a dinner party or special meal. Line a 18cm spring form tin with greaseproof paper. Now start on the base- blitz together the digestive biscuits, nuts and caster sugar until they have achieved a fine breadcrumb consistency. Add the melted butter and blitz again until it comes together then pour into the prepared tin and smooth down, packing it tightly in with the back of a spoon. Place in the fridge to firm up while you make the filling. To make the filling, whisk the cream to soft peaks then add the melted chocolate (it should be cool when added). Whisk again to combine then set aside. In a separate bowl stir together the cream cheese, sugar and salt. Fold this into the chocolate and cream mixture until you have a smooth, streak free filling. 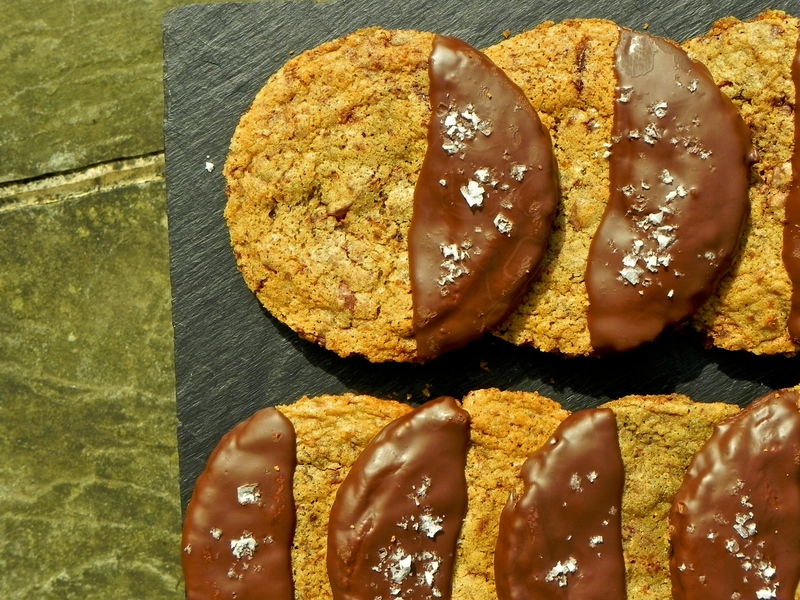 Pile this chocolate filling onto the biscuit base and even it out with a spoon or spatula. Chill for at least 3 hours to set. For the praline, place the sugar and 3tbsp water in a heavy bottom pan and gently heat until the sugar has dissolved. Once dissolved, turn up the heat and boil until it turns a deep golden colour, then add the nuts to coat in caramel and pour out on lightly oiled silicone paper. Leave to set solid. Once the cheesecake has set slice into the shapes of your choice and sprinkle with macadamia praline. I like the rectangular slices and have decorated them with some chocolate shards. Since winning the Great British Bake Off last year, mother of three Nadiya Hussain has ran with her mantra of ‘I can and I will’ by taking on numerous projects; from documentary making and recipe book writing to royal baking and countless television appearances, it seems Nadiya’s future in the food industry is bright. Last month, the reigning Bake Off champ kindly took 5 minutes out of her hectic schedule to chat food, the Queen and instant fame with myself and fellow food blogger Hannah Bond (A Bond Girl’s Food Diary ) …right after she humoured us with some fan girl photos. So, it’s been a year since Bake Off- what’s the most exciting project you’ve worked on since? It’s a tough one but I think I would have to choose baking the Queen’s 90th birthday cake- that’s a moment in history and I can’t believe I got to do it – I still have to pinch myself! How did you manage to get that commission? I was on a shoot and my agent called and told me- I was sure she’d got it wrong- as if they’d want me and not a professional… when I realised it was true I was a bit like, can I say no?! Of course I didn’t but it was a lot of pressure at first- it’s a big deal! You’ve spoken about struggling with confidence- do you think winning Bake Off helped you overcome that? Not the winning, but the process. Doing things I was unsure of or uncomfortable with on my own without my children or husband made me realise I don’t have to be a nervous or anxious person. Were you prepared for the instant fame Bake Off gave you? No, I honestly thought I would fly under the radar and go back to normal life… being in the spotlight is a new world and it’s not something I have ever experienced- I try to just take it in my stride and enjoy it because you never know when it’s going to end. Did Mary Berry give you any long lasting advice after Bake Off? She just told me to look after my family- she is such a family orientated person and I think we had that in common… she’s a bit like that Grandma you want to adopt! Some less serious questions now… what is your desert island dish? Marmite! Marmite crisps.. I can eat six packets in one go. Dream dinner party guest? David Attenborough. Every time. Favourite cuisine? Vietnamese- it’s so fresh. Two kitchen essentials? The perfect spatula and my stand mixer. Mary or Paul? I’m not answering that! Many thanks to Nadiya for chatting with us and sharing her thoughts on a very exciting year- look out for her BBC documentary series The Chronicles of Nadiya which traces her Bangladeshi roots and food heritage and pick up her book Nadiya’s Kitchen now. Everyone loves pizza, and this one is a bit different and a little more refined than your regular tomato and pepperoni. Give it a try- it’s really moreish and the homemade dough is thin, crisp and delicious! Place the flour, salt, sugar and yeast in a bowl and quickly mix together. Add the olive oil and water in one go and mix together with a cutlery knife until it comes together. Form into a ball of soft but not sticky dough and knead for 10 minutes. Oil the bowl and return the dough to it. Cover with oiled cling film and leave to rise in a warm place for 1 hour. While the dough is rising, prepare the toppings. For the onions, slice finely and sweat with oil on a low heat in a saucepan until soft and translucent. Once soft, up the heat, add the brown sugar and allow to caramelise, stirring occasionally to prevent catching. Set aside to cool. Slice the figs thinly, crumble or slice the goats cheese and pick the thyme leaves. If you’d like to make your pesto check out my wild garlic variety here. Preheat the oven to 220c or the highest setting. Place 2 flat trays in the oven sprinkled in semolina. Take your risen dough (it should doubled in size), knock back (by quickly knocking excess air out) and split in two. Roll out on a floured surface to about 5mm thick (don’t worry too much about the shapes, just make them as circular as you can- or make rectangular pizzas like mine!). Make sure the bases are moveable and not stuck to the surface at this stage. Spread the pesto thinly on each pizza then add the caramelised onion, figs and goats cheese. Sprinkle over the thyme and drizzle on some honey. Finish with a sprinkling of sea salt and a crack of pepper. Now comes the tricky bit; take a third flat baking tray and sprinkle with semolina. Very quickly slide it under the first topped pizza in one movement then transfer it to the preheated baking tray in the oven in another quick jolt. Repeat with the second pizza and bake for 8-10 minutes (this movement takes time to perfect but it produces well cooked dough with crisp bases!). When the pizza is ready dress in some good quality olive oil and top with rocket. Chop the chocolate into smallish pieces. Cream together your butter and sugars with an electric whisk (or stand mixer) until light and fluffy. Add in the eggs one at a time and beat between each addition. To prevent curdling, add a little of the flour after each egg too. Add the remaining flour, salt and bicarbonate of soda and whisk again until a thick dough has formed and all the ingredients are incorporated. Add the chopped chocolate and mix well with a wooden spoon to evenly disperse. Roll the dough into a sausage shape about 10cm in diameter and wrap in clingfilm. Chill for an hour. Preheat your oven to 180c and line 2 baking trays with greaseproof paper (you will need to batch cook these cookies as they spread). Take your firmed cookie dough from the fridge and chop into discs (around 2cm thick). Place three on the baking sheets at a time and bake for 12-15 minutes until they have a cracked appearance but are still soft in the middle (this means your cookies will be chewy!). Repeat with the remaining cookie dough and once baked leave to cool completely on a wire rack. For the finish, melt 200g dark chocolate in a bowl over a pan of simmering water. Set aside and leave to cool slightly. Once slightly cooled dip your cookies in the chocolate (over about 1/3 of the surface) and sprinkle with sea salt. Leave to set (if you can!) and enjoy! These take no time to make and are my personal guilty pleasure; you can’t beat a chewy peanut butter cookie studded with white chocolate chips! Preheat the oven to 180 and line 2 baking trays with greaseproof paper. Sift the flour, bicarbonate of soda, salt and caster sugar into a large mixing bowl. Melt the butter, peanut butter and dark soft sugar in a saucepan. Allow to cool a little then add the egg yolk and egg. Whisk together until smooth. Add the egg and butter mix to the dry ingredients and stir thoroughly to form a soft but firm cookie dough. Mix through the white chocolate evenly. Roll heaped tbsp amounts of the dough into balls and place onto the prepared trays, ensuring that you leave space for spreading. Bake for 10-15 minutes for a soft chewy centre. They will be very soft when you remove them from the oven so leave on the tray for a little while to allow them to firm up before eating! This loaf cake is really light and zingy; I developed the recipe as a bit of a change from all the heavy fruit cakes and chocolatey bakes we’ve been eating over Christmas (not that this is health food by any means!). Try it out- it’s really easy to make but still looks impressive! To make the cake, you will need: 200g grated carrot, 4 pieces stem ginger (grated), 2 eggs, 200ml vegetable oil, 150g caster sugar, 50g light brown soft sugar, 250g plain flour, 2tsp baking powder, pinch salt, 1tsp cinnamon, 1tsp mixed spice, 1tsp ground ginger, zest 1 lemon, 2tbsp greek yogurt. Preheat the oven to 180c. Grease and line a loaf tin. Whisk together the eggs, oil, light brown sugar, salt and lemon zest in a jug. In a large mixing bowl, sift together the caster sugar, plain flour, baking powder and spices. Make a well in the centre and pour in the egg mixture. Using a wooden spoon, beat the wet into the dry until fully incorporated and smooth. Add the greek yoghurt and stir thoroughly to loosen the consistency. Add the grated carrot and ginger and mix in. Pour the cake batter into the prepared loaf tin and bake for 30-35 minutes. When the cake is golden brown (or a skewer comes out with only a few moist crumbs attached) it is ready. Remove from the oven and cool for 5 minutes in the tin, then remove from the tin and cool completely on a wire rack. For the frosting and decoration, you will need: juice 1 lemon, 250g cream cheese, 1tbsp icing sugar, zest 1 lemon, crystallised ginger, lime zest. While the cake is cooling, pierce lots of holes in the surface. Pour the lemon juice over so it seeps through the holes. Set aside. In a small bowl beat together the cream cheese, icing sugar and lemon zest. Spread over the top of the cake (it must be cool to do this) and sprinkle chopped ginger and lime zest down the centre. Slice up and serve (this cake is even better after a couple of days- if it lasts that long!). This toffee apple cake, sandwiched together with salted caramel and toffee frosting, makes for the perfect table centre piece, especially when topped with honeycomb, haphazard spun sugar and mini toffee apple decorations… Give it a go this Halloween and you’re guaranteed to be popular with friends and family, old and young! Grease and line two 20cm cake tins. Preheat the oven to 180c (fan). Sift together the flour, salt, bicarbonate, baking powder, spices and caster sugar. Mix to combine. In a jug, mix the eggs, melted butter and brown sugar. Chop your apples finely into chunks. Make a well in the middle of the flour mixture. Pour in the wet eggy liquid. Stir with a wooden spoon to fully combine and incorporate. Fold through the apple. Separate the mix between the two tins and level the tops. Bake for 35-40 minutes or until a skewer comes out clean when inserted. When cooked, leave for 5 minutes to cool in tins then turn onto a wire rack to cool completely. Place the sugar, butter and milk in a saucepan and melt. Stir gently and set aside. When cooled slightly, add the melted mixture to the icing sugar and stir until combined. If too thick, add drops of milk until a spreadable frosting consistency is achieved. For the salted caramel recipe I use, click here. Trim the tops of the cakes if they’re not even, then spread 1tbsp salted caramel over the tops. Spread a generous swirl of the toffee frosting over the bottom layer and sandwich the other sponge over it. Coat the entire cake in toffee frosting, using a palette knife to achieve a smooth finish. Drizzle some salted caramel over the top. For the crushed honeycomb recipe (optional) visit my last post and cancel out the chocolate! Sprinkle the honeycomb in a circle around the top of the cake. Roll the icing into small balls (slightly smaller than golf ball sized) and stick onto the end of a kebab stick. Place in the freezer to harden. Place some caster sugar in a saucepan and melt over a medium heat. Once dissolved, let the sugar brown then remove from the hob. Take the icing balls from the freezer and dip in the sugar then leave to set. Arrange in a haphazard fashion around the top of the cake. As a keen cook, I thought (despite my association with baking) it was about time I start sharing savoury recipes for fresh and simple meals I like to cook for myself and my family. For my first ‘Join Me For Dinner‘ post, I will be sharing my recipe for a simple but absolutely delicious wild garlic pasta with a very special smoked ham (I picked the garlic for this meal just yesterday, so it’s super fresh!). This seasonal dish works brilliantly at this time of year as wild garlic is growing in abundance (you can find it in patches of woodland and near rivers), but if you don’t have access to it or discover this recipe a little late, just use a basil pesto instead, but try to make it from scratch (you’ll never go back!). Wild garlic has a really subtle flavour and enticing scent which pairs well with lots of different ingredients; for example, you could use this pesto to coat a chicken breast, rub into a slow roasted leg of lamb or just spread onto bruschetta. Simply place all these ingredients in a food processor and whizz until smooth- it’s that easy! Pop your tagliatelle in a saucepan of boiling water and leave to cook for the recommended time. Heat a tablespoon olive oil in a large pan (high heat) and add your cherry tomatoes, halved. Once the tomatoes begin to soften (after a couple of minutes), add the sun dried variety and toss in the oil. Now throw in your ham (chopped into small pieces) and continue to move about the pan. Drain your pasta and add to the hot pan of tomatoes and ham with another tablespoon of olive oil and the pesto. Toss through the pesto and other ingredients until the tagliatelle is a bright green colour throughout (so you know all the components are well combined). Serve up a heap of the steaming pesto pasta in a bowl and top with a sprinkling of pine nuts and some parmesan shavings. I hope you enjoy this recipe, wild garlic is so worth making the most of if you have access to it- it’s delicious (and free!). With poppy seeds for texture, lemon glaze for tartness and white icing for a deliciously sweet finishing touch, this fluffy light sponge cake is sure to become a firm spring favourite in your household. The bundt shape makes this bake something special, but feel free to cook in any tin you like for an everyday treat. Preheat the oven to 180c (fan) and grease and flour your bundt tin (this ensures easy removal of the cake when baked!). Cream together your butter and sugar using an electric whisk until light and fluffy. Now add the eggs one at a time with a little of the flour; whisk between each addition and once all the eggs and flour have been combined, stir in the vanilla and baking powder. Now whisk in the honey, sour cream, zest and juice of the lemons until combined. The mix should be light and thick. Fold in the poppy seeds. Spoon the mix into the tin and even out. Place in the oven on a middle shelf and bake for 50-60 minutes or until golden brown. Leave in the tin for 5 minutes then transfer onto a wire wrack. Place your sugar and lemon juice in a small pan and heat for 5 minutes, stirring occasionally. Remove from the heat. Using a skewer, make holes across the surface of your cake. Pour the hot lemon glaze all over the the sponge, allowing it to sink into the holes. Leave to cool for 10 minutes. Now, combine the icing sugar and water and drizzle all over the cake. For decoration, use some poppy seeds and more lemon zest. Eat warm from the oven with a dollop of creme fraiche or cool and have a slice with your afternoon cuppa.